Roger Whyte, a senior executive with Cessna for over 28 years, has become the new Chairman of CEPA (Central European Private Aviation), the non-profit organisation created to support the development of business aviation in Central and Eastern Europe. CEPA, which holds its 2014 Expo on 19th and 20th November 2014, has recruited Mr Whyte to take over from the outgoing Chairman, Philippe Lienard, to help guide the organisation through its fifth year of growth. He will use his extensive experience in global business development and event management to further position the flourishing CEPA Expo as the leading event in the region. Roger Whyte gained commercial aviation experience in the mid 1970’s during his time with OEFAG Aviation Services, an FBO with locations across Austria, where he worked closely with Austrian Airlines on the establishment of Austrian Air Service regional airline. In 1982 Cessna Aircraft Company appointed Mr Whyte as Citation regional sales manager and he was subsequently promoted to Director Europe, Middle East and Africa and later to Director of International Citation Sales. After a brief period with Raytheon Aircraft Company in 1994, as Vice President International Sales, Roger Whyte returned to Cessna as Vice President Worldwide Citation Sales. In 1997 he was promoted to Senior Vice President of Cessna Sales and Marketing responsible for all aircraft product lines, a position which he held until his retirement at the end of 2010. Roger Whyte served as the Chairman of the Associate Member Advisory Committee and as a Board member of the NBAA and was also a founding board member of the Air Charter Safety Foundation. He has served on Duncan Aviation’s Advisory Board and as a member of the Board of Trustees of the United States National Aviation Hall of Fame. In 2011 Mr Whyte was based in Shanghai, China on a special assignment for the NBAA to help lay the groundwork for The Asian Business Aviation Convention and Exhibition, ABACE which has become the premier business aviation forum for that region and is now being held annually. I often write about the things I believe we all should be doing, trying or experimenting with in order to maximize our success and happiness. However, it’s not always the things we do that make the biggest difference in our lives; it’s often the things we avoid doing that have the biggest effect. As human beings, we have a strong aversion to not doing; we feel that in order to produce results, there must be an initial action. However, because we are almost always doing something, piling on more and more often has a negative effect, rather than a positive one. Among the mentally strong, there are several actions that are avoided in order to produce the greatest benefit in the shortest period of time. If you’ve ever felt a warm glow inside when in love or hot headed with anger, there may have been more to it than you thought. Scientists have suspected for a long time that emotions are connected to a range of physiological change and now a study has shown that emotional states are associated with specific sensations regardless of a person’s culture. 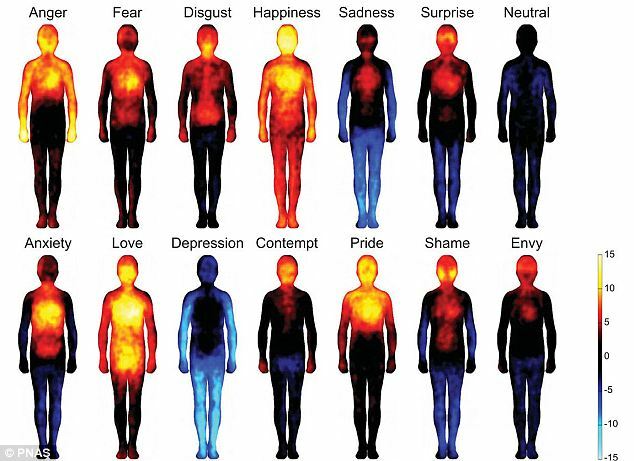 The research visually shows that heartbroken people really do feel an ache in their chest, weak with sadness or feel happiness spreading over their entire body. Being in love makes a person feel a warm glow everywhere apart from their knees, perhaps hinting that there may be something in the popular saying that the object of a person’s affection makes them ‘weak at the knees’. Sadness leaves our limbs feeling weak and we are extra-aware of activity in our chest – and heart. Depression also leaves us feeling weak, while disgust is felt in the throat and digestive system. 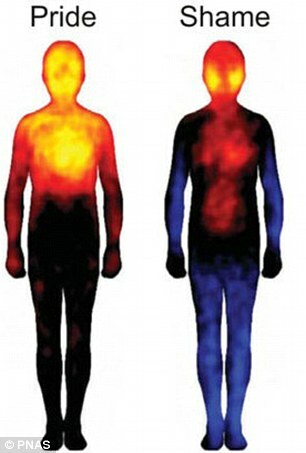 Basic emotions including anger and fear cause an increase in sensation in the upper chest area, which could be because we are subconsciously preparing for a fight. The findings come from Finnish researchers who showed 700 volunteers films and read them stories designed to evoke particular emotions. 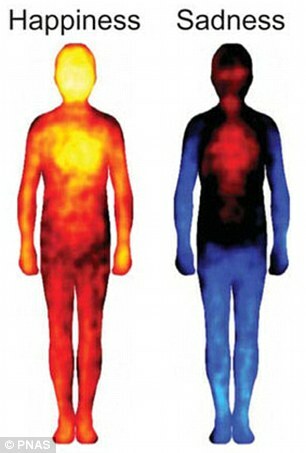 The men and women were then given outlines of bodies and asked to colour in the parts they felt became more active or less active. The results were the same across cultures, with love ‘felt’ right down to people’s toes and happiness suffusing the whole body with feeling. Next time you are in love or angry think of these pictures and protect your heart – you need it.